Resource CEO Invites Lt. Gov. Patrick to "come use the bathroom"
As lesbian-gay-bisexual-transgender community leaders showed off their new home in Dallas Saturday, they did not shy away from the so-called "bathroom debate" playing out across the country. Before cutting the ribbon on the new, 20,000 square foot facility near Dallas Love Field, Resource Center CEO Cece Cox brought the bathroom debate front and center before the crowd of hundreds there for the event. Cox and several other speakers went on to address Lt. Governor Dan Patrick’s recent stand on the issue in Fort Worth. 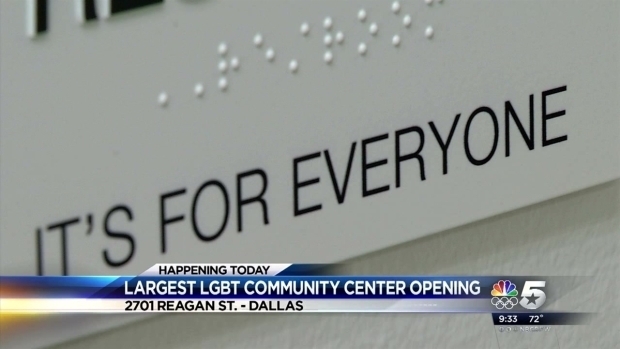 NBC 5 reporter Brian Scott was live in Dallas ahead of the opening of the Largest LGBT Resource Center at 2701 Regent Street. Earlier this month, Patrick held a press conference before a Fort Worth ISD board meeting challenging a district policy that will, among other things, allow transgender students to use the restroom or locker room of the gender they identify with. Lt. Patrick said students should only use the restroom or locker room that is on their birth certificate. Cox said that situation along with violent attacks on gay men in Oak Lawn since last September have created more of a need than ever for their expansion. "In this whole environment of talking about bathrooms and discrimination against the LGBT community, we're standing for justice and love and equality,” she said. The Resource Center offers several health services to people fighting HIV and AIDS, but also strives to empower the LGBT community through counseling services, youth programs, advocacy, and other offerings. Those services are featured at the new building at 5750 Cedar Springs Road in Dallas. Along with the new facility, the organization will continue to operate their clinic and food pantry locations at 2701 Reagan Street in Dallas. Cox said Saturday that would include, if he’d like to come discuss the topic, the Lt. Governor himself. Lt. Patrick vowed at the state Republican Convention to create a bathroom bill for Texas similar to the one in North Carolina. Advocates for action on the matter, like Lt. Patrick, say the rules are about safety in the privacy of those public restrooms. “We will pass legislation in the state senate this session to keep men out of ladies rooms and locker rooms and showers and bathrooms,” Lt. Patrick told the crowd at the convention.